Chairs of Academic Boards and Senates from across Australia attended the conference, which was hosted by the University of Newcastle on 9-11 October 2017. The three-day program provided a forum for attendees to discuss industry specific topics including: Academic Governance in times of change, Academic Board Innovation, the student experience, Academic Integirty, Compliance, and Inclusiveness and decision-making. It was widely recognised as a highly successful, productive and enjoyable conference. 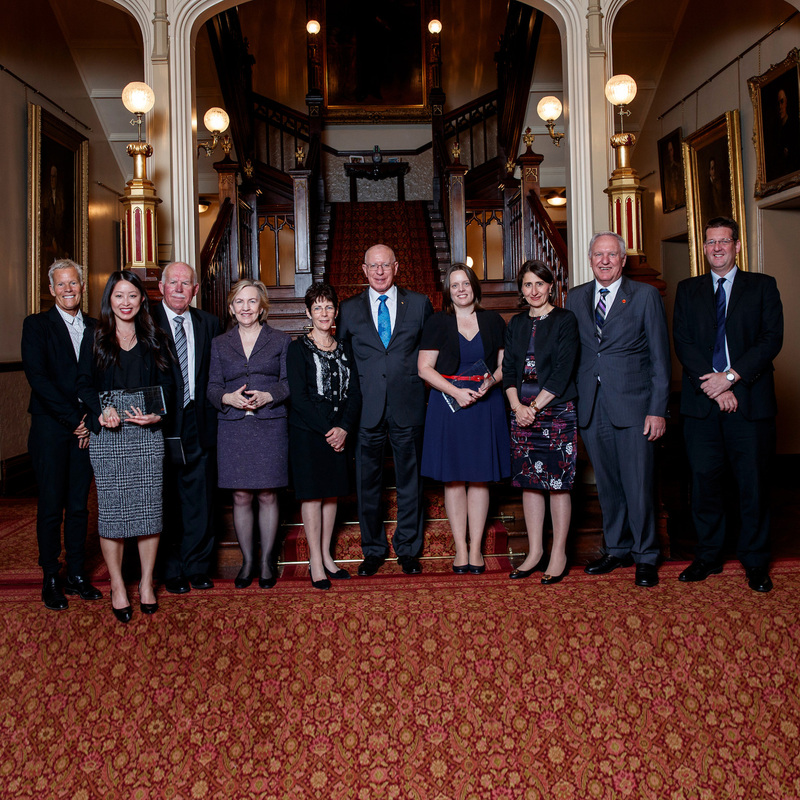 On Monday 23 October, the Chancellor attended a reception held at Government House to celebrate the Premier's Prizes for Science and Engineering. Associate Professor Sarah Johnson was named the category winner for Excellence in Engineering and Information and Communications Technology, and Dr Susan Hua was named NSW Early Career Researcher of the Year. During October the Chancellor attended the University's graduation ceremonies. Congratulations to all who graduated during these ceremonies. The Vice-Chancellor thanked the University and broader community for their warm wishes in response to the announcement of her decision to retire in October 2018. The search for the University's eighth Vice-Chancellor will begin shortly. The Deputy Vice-Chancellor (International and Advancement) and the Director International Enrolments and Partnerships gave a presentation on the implementation of the University’s International Strategy. Council supported the initiatives presented, and discussed opportunities to continue to achieve growth in this area. The Deputy Vice-Chancellor (Academic) presented a report, which emphasised the need for pedagogy-driven technology and the importance of supporting and developing the University’s staff to support the education redesign. Consideration was also given to the student journey and the university's online learning strategy. The Chief Information Officer provided an update on the university's digital strategy. He outlined the recent progress in IT project governance, the emphasis on strategic partnerships and alliance frameworks, cyber security, and the initiatives to review and enhance the University’s IT capability and operating model. Council congratulated Ms Dianne Allen, who has been re-elected to UON’s Council and re-elected as Deputy Chancellor. Learn more about Dianne Allen. Mr Vivak Bhavitheren (Bhavi) Ravindran was elected by students as a student Council member for a one year term commencing 1 January 2018. The Council discussed the proposed budget, taking into consideration current student load targets, business costs and expenditure figures. Subject to reviews in investments and expenditure across the organisation, the proposed 2018 budget was supported by Council. Productive discussion on the Alumni Advisory Committee. Discussion on the future direction of NUsport. Focus on aligning UON Singapore's activities with the University’s International Strategy. Engagement with the Audit Office in relation to the 2017 audit process. Consideration of the NeW Futures Capital Investment Program. Discussion on the University’s Environmental Sustainability Plan and Energy Strategy Update. The importance of supporting a culture of health and safety leadership. Council resolved to note the verbal research and innovation update from the Vice-Chancellor. Council resolved to note the International Strategy Update provided by the Deputy Vice-Chancellor (International and Advancement) and the Director International Enrolments and Partnerships. Council resolved to note the Draft UON Education Re-design: Incorporating a NeW Education Framework. Council resolved to note the status update on the delivery of the NEW IT Strategy 2017-2025. Council resolved to approve the 2018 Budget, subject to the Executive taking the actions identified by the Council. Council resolved to note the revised Long Term Financial Plan 2017. Council resolved to note the Quarter Three (Q3) 2017 UON Corporate Performance Report. Council resolved to approve the 2018 UON Corporate Plan. Council resolved to note the verbal update from the Vice-Chancellor on the appointment of an independent TUNRA director. reappoint Ms Dianne Allen as an external Council-appointed member of the Council for a further term of 2 years from 1 January 2019 to 31 December 2020. Council resolved to confirm Ms Dianne as duly re-elected Deputy Chancellor for a further 2 year term with effect from 31 March 2018. Council resolved to approve the agenda for the Council Governance Workshop to be held on 8 December 2017, with the changes requested by the Council. Council resolved to note the President of the Academic Senate's verbal report in relation to the Academic Senate meeting held on 15 November 2017. Council resolved to note the Chair's verbal report in relation to the Nominations and Governance Committee meeting held on 8 November 2017. Council resolved to note the Chair's verbal report in relation to the Controlled and Associated Entities Committee meeting held on 8 November 2017. Council resolved to note the Chair's verbal report in relation to the Risk Committee meeting held on 8 November 2017. Council resolved to note the Chair's verbal report in relation to the Finance Committee meeting held on 9 November 2017. Council resolved to note the Chair's verbal report in relation to the Strategic Development Committee meeting held on 9 November 2017. Council resolved to note the Chair's verbal report in relation to the People and Culture Committee meeting held on 9 November 2017.
approve the addition of Student Accommodation to the Register of Commercial Activities. Council resolved to approve the Internal Audit Plan for 2018 - 2020 report. Graduate Certificate – Awards and Programs Schedule – 001023 (Doc D17/288944). Council resolved to note that the Vice-Chancellor and the Dean of Graduate Research under delegated authority [A9.3] confer the Higher Degree Research candidates to the degrees listed in documents RTSC 17.095, RTSC 17.101, RTSC 17.108, RTSC 17.119 and RTSC 17.125 (Doc D17/288944). updated Matters Reserved for Council and Council Committees. Council resolved to note the draft minutes from the Academic Senate meeting on 15 November 2017 were not available. thank Mr Johnson for his valuable contribution as a member of the Council and wish him well in his future endeavours.